You’ve probably heard of ridesharing apps, such as Uber® or Lyft®; however, you’re probably not aware that Colorado is the first state in the country to legislatively authorize ridesharing companies. 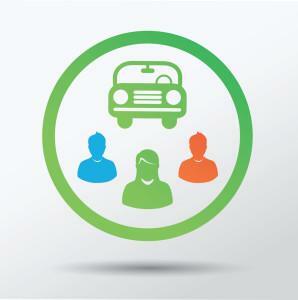 Ridesharing companies, or transportation network companies (TNCs), are becoming increasingly popular. The apps often provide cheaper means of transportation than a taxi by matching up a driver with a passenger in a local city. Most apps are free to download, and are easy to use. For example, Uber works by providing an app where you can reserve a personal driver in the cities where the transportation network operates. Uber currently operates in Denver. You will most likely be required to create an account and provide basic personal information and billing information. Once you sign in Uber provides five types of services including black car, taxi, uberX (this is the everyday car), SUV, or a luxury car. UberX is the ridesharing option, while the other choices are commercially licensed drivers. You choose your pick up location and then wait for your ride. The app will tell you when the ride should arrive and provides the fare rate. All payments are made electronically—no cash needed. The new Colorado law regarding ridesharing became effective January 15th. Colorado defines a TNC as a “corporation, partnership, sole proprietorship, or other entity operating in Colorado, that uses a digital network to connect riders to transportation network company drivers for the purpose of proving transportation.” In other words, a TNC is not a taxi service, and has a separate set of guidelines from taxi services or public transportation services. A TNC driver must be at least 21 years old, possess a valid driver’s license, proof of auto insurance, and proof of Colorado vehicle registration. The TNC is also required to conduct safety inspections of all prospective drivers’ vehicles before approving them, as well as, conduct a criminal history check. The company is also required to obtain a permit from the public utilities commission, and the permit is only valid for one year. Please check all requirements if you are interested in becoming a driver for a TNC. The TNC is required to file a certificate of insurance with the public utilities commission showing that the company has an insurance policy issued by an insurance company authorized to do business in Colorado. The coverage must be in the amount of one million dollars “per occurrence for incidents involving a driver during a prearranged ride.” The drivers must also have personal automotive liability insurance with at least the state minimum coverage. The company must check that all drivers have the proper insurance. Uber’s insurance coverage includes $1 million of liability coverage per accident, $1 million of uninsured/underinsured motorist bodily coverage per incident, $50,000 of contingent comprehensive and collision insurance, and more. Uber’s blog page shows a great image on how insurance works from personal through commercial insurance coverage. Due to Colorado’s legislation, USAA insurance company has started a pilot program in Colorado for ridesharing. The USAA insurance pilot program will cover drivers during the period when drivers turn the ridesharing app on until they are matched with a passenger. This is called “contingent” liability coverage, rather than the primary liability coverage that you would have under your personal policy, or the primary commercial insurance coverage offered by a TNC. When the app is off the driver is using his or her own personal auto insurance, and when the driver has a passenger the TNC’s commercial insurance coverage is in place. This may differ depending on the TNC. USAA’s program will start in February, and costs about $6 to $8 a month with an existing policy. While these apps are extremely handy, there is always the risk of an auto accident, and possible insurance gap coverage. The team at McDivitt Law Firm encourages safe driving by everyone, including TNC drivers. However, if you are injured in an auto accident and dealing with the insurance company becomes too complicated, please contact a Colorado Auto Accident Attorney at McDivitt Law Firm for a free evaluation.